Close your eyes and think back to your childhood. What is one thing you wish you had growing up? For me it was a playhouse. A playhouse is every child’s dream. Actually, I was quite lucky because we had a great playhouse (it was kind of a tree house built on a huge stump. One thing we didn’t have was a huge backyard playground). It’s a place where kids are free to explore, where they can set their own rules, and let their imaginations go wild. In addition to enabling some creative play time, playhouses may also provide parents with some much needed respite from the chaos that comes with kids. There are many options for playhouses that work in a variety of spaces and are also available in a multitude of styles that are bound to make little boys and girls squeal with delight. 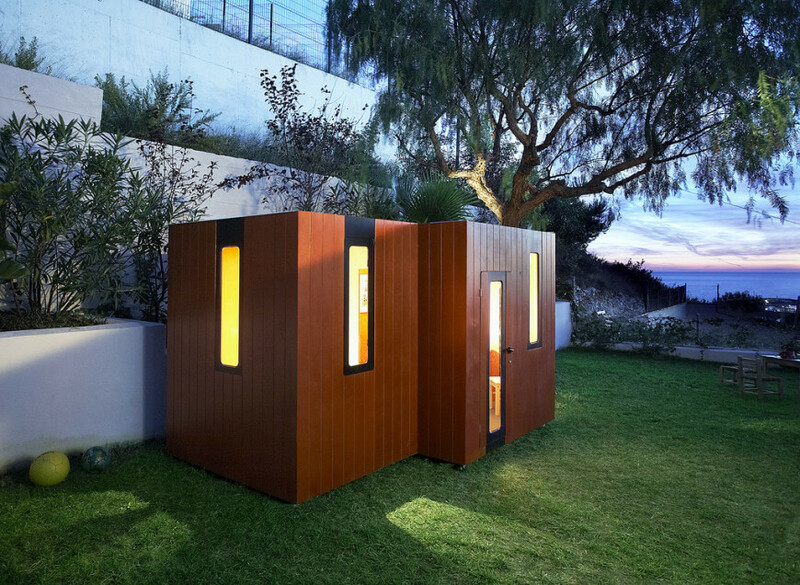 However, the it’s important to know what’s involved in adding a playhouse to your yard. 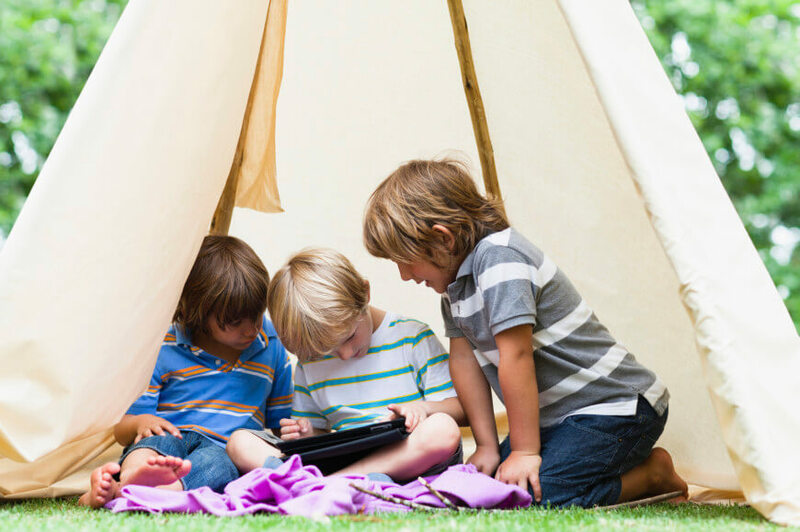 Here is what you need to know if you plan on adding a playhouse to your backyard. Dedicated Space – Everyone with kids has done it. Stubbed a toe, poked a foot, even taken a tumble due to errant toys left in undesirable places. A playhouse provides a proper home for those pesky obstructions. Responsibility – Playhouses provide an excellent opportunity to teach children how to care for a space. Empower them by providing their own “home” to tidy-up and maintain. A Full Night’s Sleep – After a full day engaging in the wide range of activities associated with a playhouse, your kids are bound to sleep better, and that, my friends, is a blessing. Safety – Depending on the type of playhouse you choose, there may be safety concerns associated with the structure. Especially if your playhouse involves climbing ladders, ropes, or using swings. 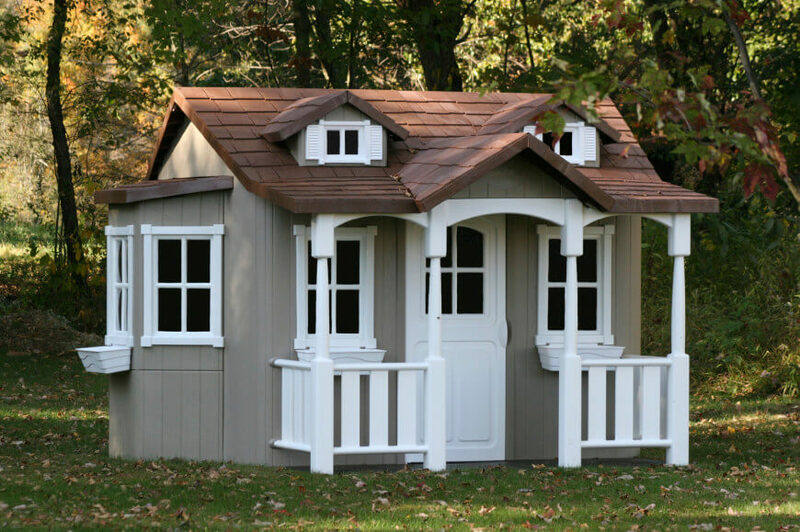 Cost – While there is a wide range of playhouse styles to choose from, more durable structures tend to be expensive. Also depending on the type of structure you choose, you may be required to pay permitting fees to your local building department. Longevity – The truth is, children grow up and as they do their play habits change. Before investing in an expensive play structure, perhaps consider building something that can later serve some other purpose. 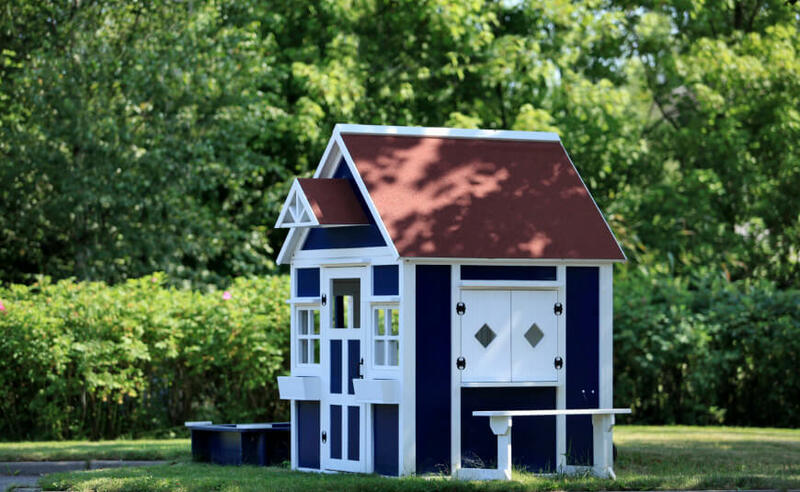 Playhouses come in a variety of materials, but most often are made of plastic or wood. 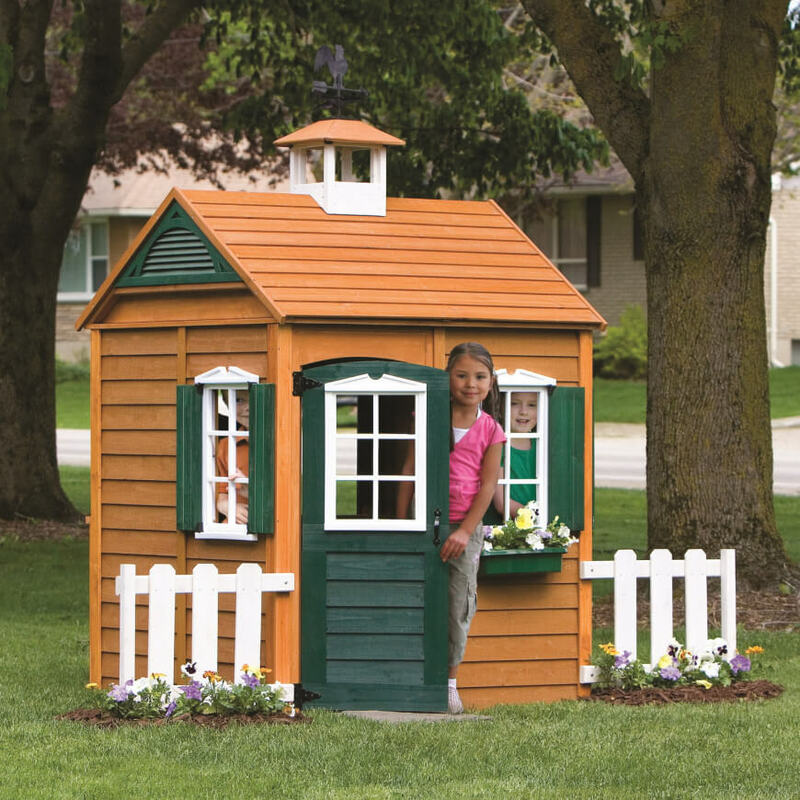 Prefabricated plastic playhouses are readily available at toy stores and range from $99 to $300. (Source: Walmart) While larger more permanent made to order or custom structures can range anywhere from $1,500 to $36,000 (Source: Rosenberry Rooms). Other costs to consider when building a playhouse are furnishing the playhouse. A child’s imagination will only take them so far. You may want to save room in the budget for kinder-sized housewares as well. Lastly, if you live in a place with snow, you will need to weatherproof your playhouse. Alternatives to preparing a structure for the winter, would be to select a structure that can be broken down and erected seasonally. 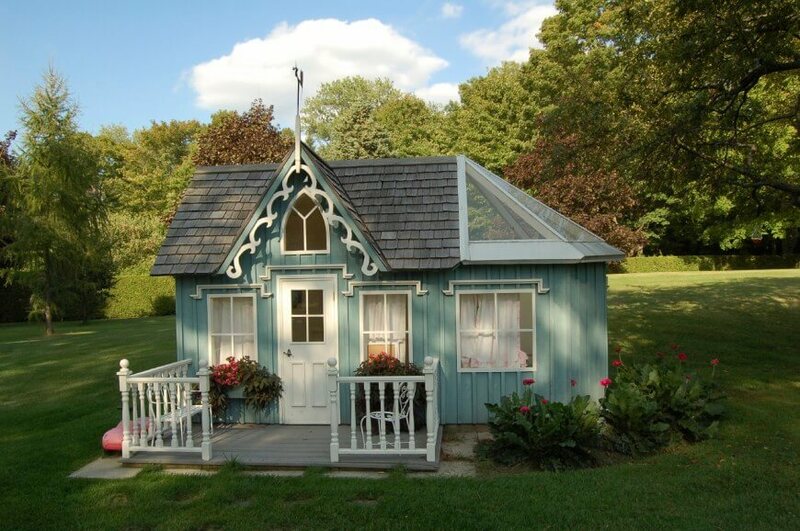 We encourage you to take some inspiration from our gallery of backyard playhouses. 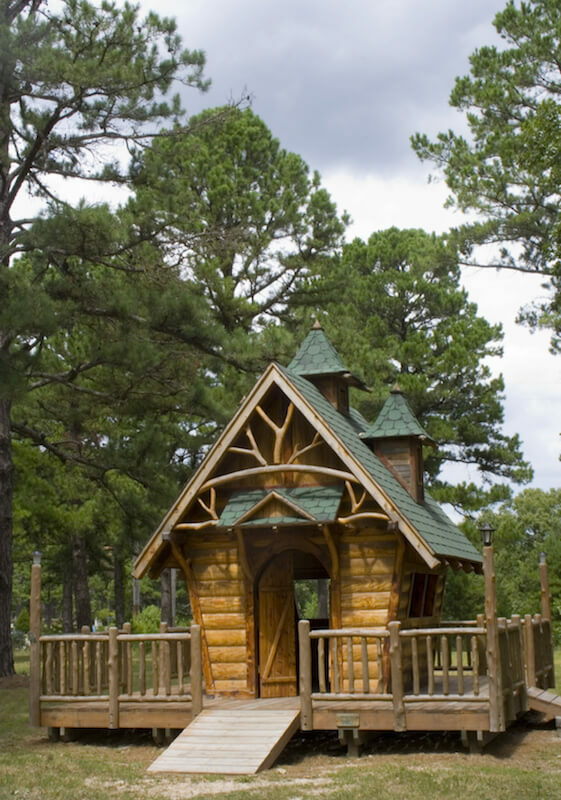 Check out these playhouse examples for size, layout, design, roof, door ideas and more. Looking for other ideas to improve your backyard? Explore more ideas here! 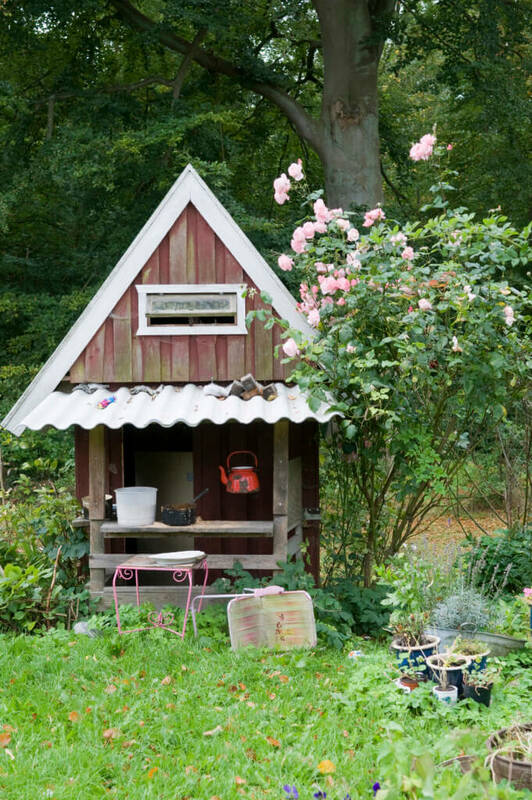 Childeren’s playhouse with window shutters and window planter boxes. 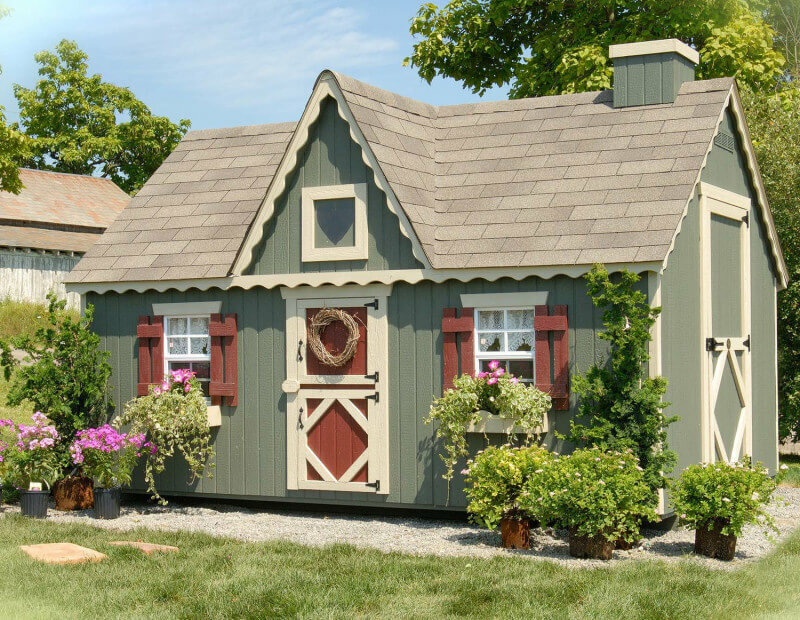 Wooden shutters and window boxes make this miniature playhouse look just like home. Including window boxes and a bench are excellent additions for kids to enjoy. This more elaborate plastic house provides the quaintness of a wooden house with the durability of plastic, which makes it an excellent choice if you want to have a structure that looks realistic, without dealing with the maintenance issues of wood. A friendly white picket fence bordered by pansies matches the white trim windows on the door and walls. Also the hunter green door and shutters give the playhouse an authentic farmhouse look. Learn more here. It’s fun to experiment with different materials. 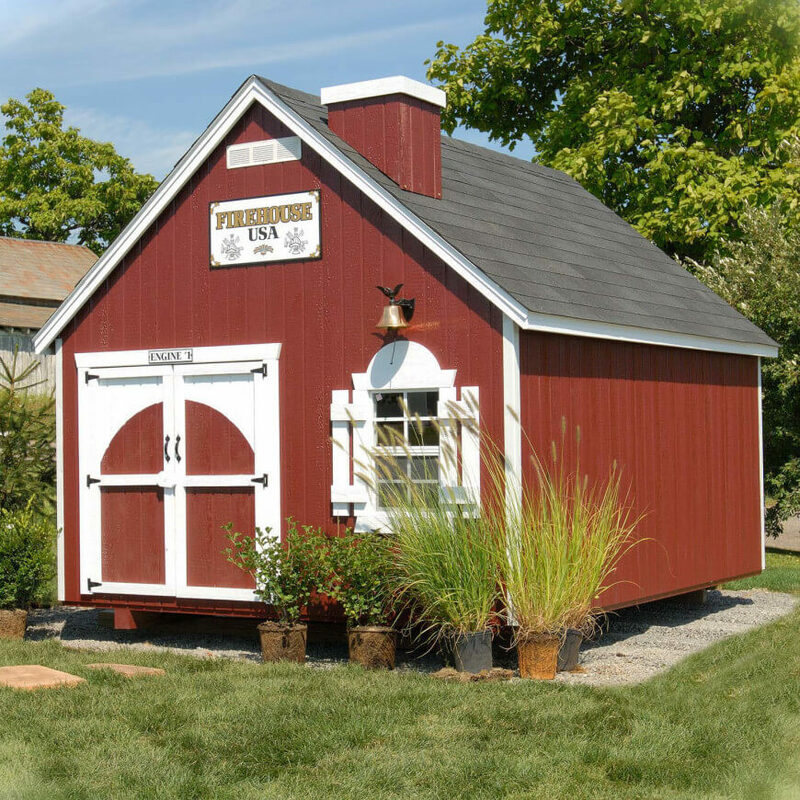 The corrugated metal roof on this playhouse gives it character reminiscent of an old country store. 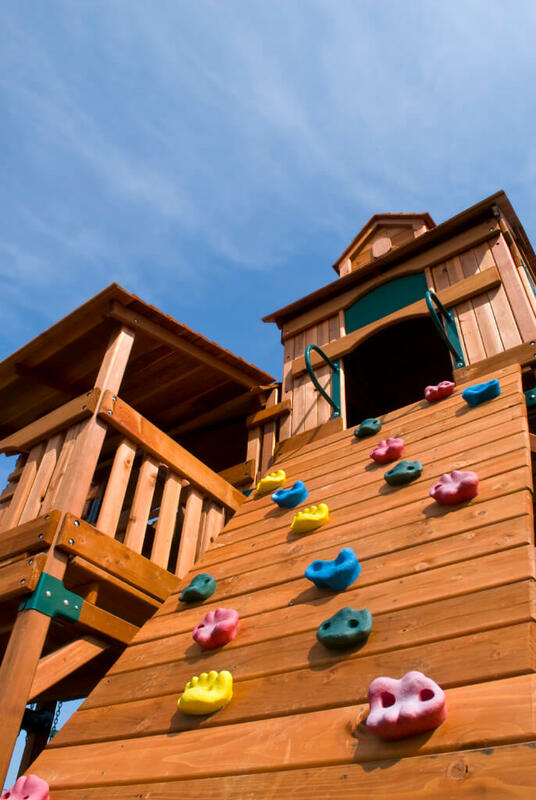 Climbing grips are a fun addition to this cedar play structure. You can incorporate all kinds of different features, like a make believe telescope or sundial to make your playhouse unique. Sirens will sound when your kids play in this firehouse inspired playhouse, equipped with wide barn doors (great for running in and out) and a chimney. Learn more here. Cute heart window cutouts and a complementary gingerbread trim make this log cabin style playhouse unique. You can experiment with all different kinds of trims and borders to add pizazz to any playhouse. If you are looking for a more portable solution, or a structure that can be taken down during the winter months, consider a teepee! You can even decorate the fabric to complement your children’s interests. 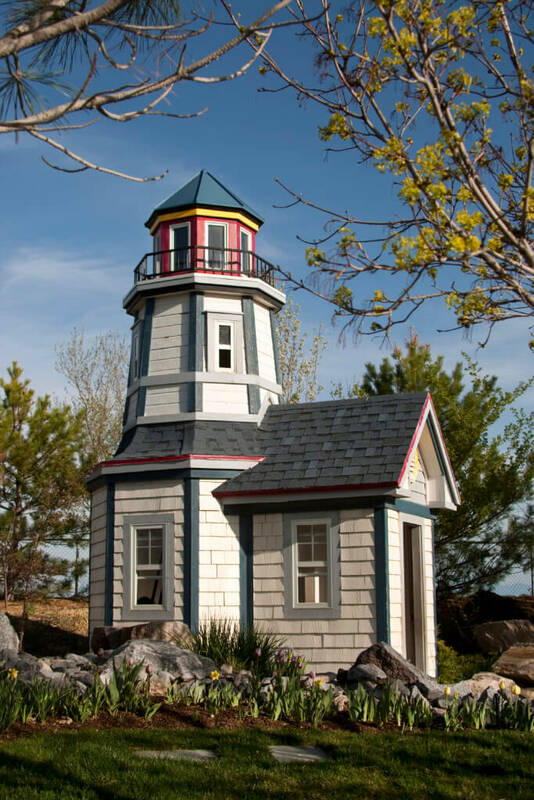 Lookout for fun in this Cape Cod style lighthouse building! Complete with light tower and circling balcony, this charming structure is a sea-loving child’s dream. 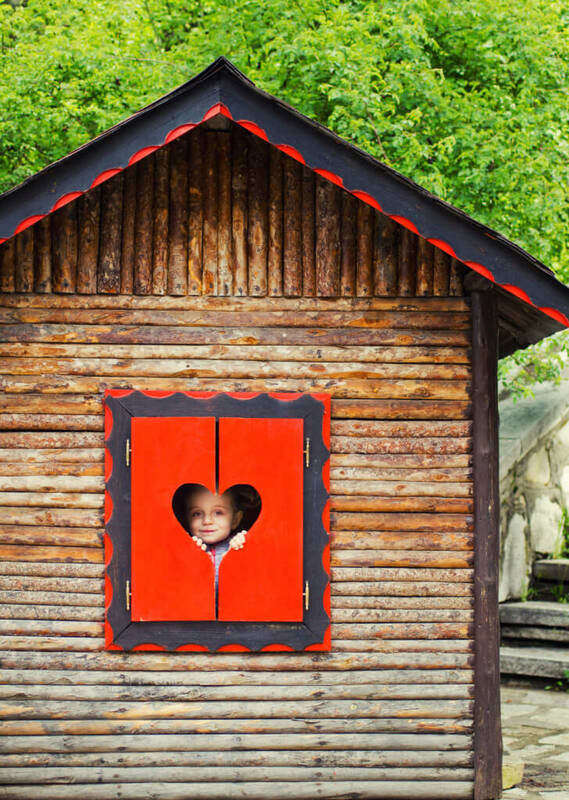 Add color to a log cabin playhouse for a touch of whimsey. 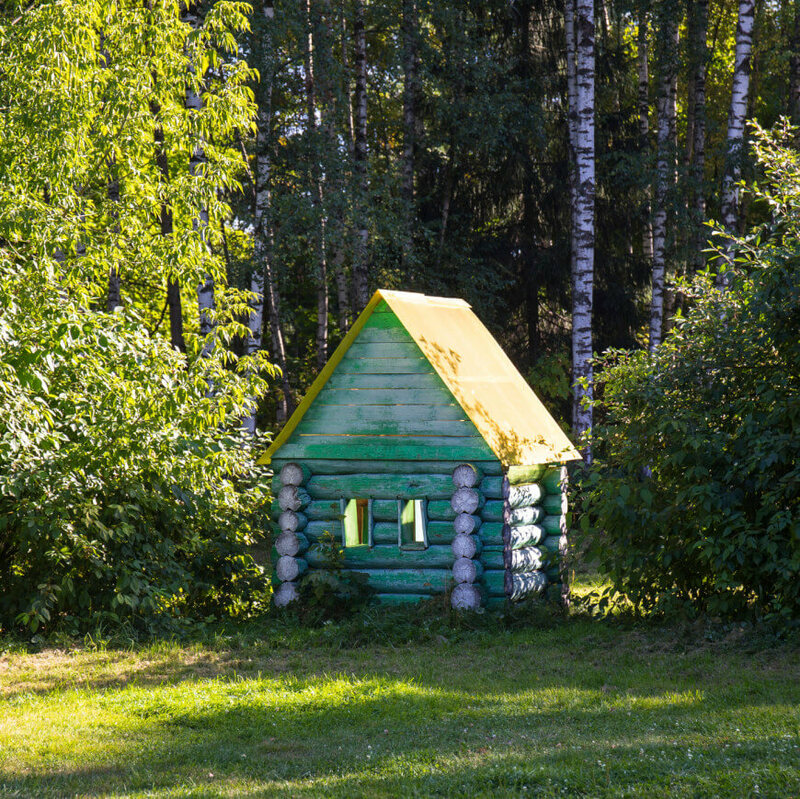 The yellow roof complements the pale green chosen for this rustic playhouse. Dutch doors and cottage style windows make for an adorable country playhouse. This structure is also large enough that it could double as a storage shed when the children grow up. Shop the look. A bright yellow slide makes for a great exit from this stilted structure. Also the concrete pad beneath the structure also serves as a great mud-free play area. A skylight and picket fence make this Victorian farmhouse a charming place for a tea party. Wood detailing along the windows and entryway give the structure give the facade a delicate quality. 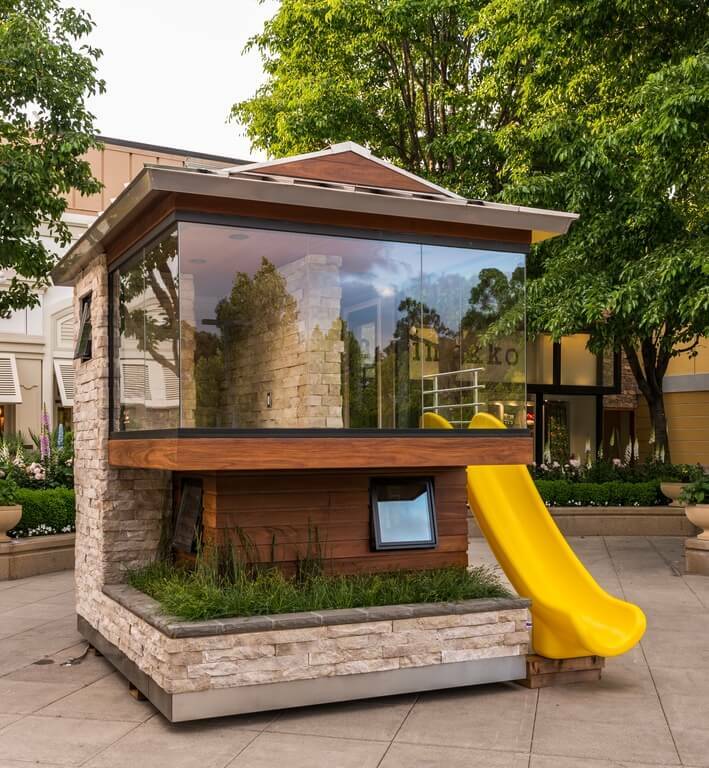 Stone detailing and glass walls make for an ultra modern and chic play structure. If you have a modern style home, consider building a modern style play structure to match. One last modern playhouse for out list. This cubic structure features geometrically odd windows and doors to give it a sleek futuristic look. 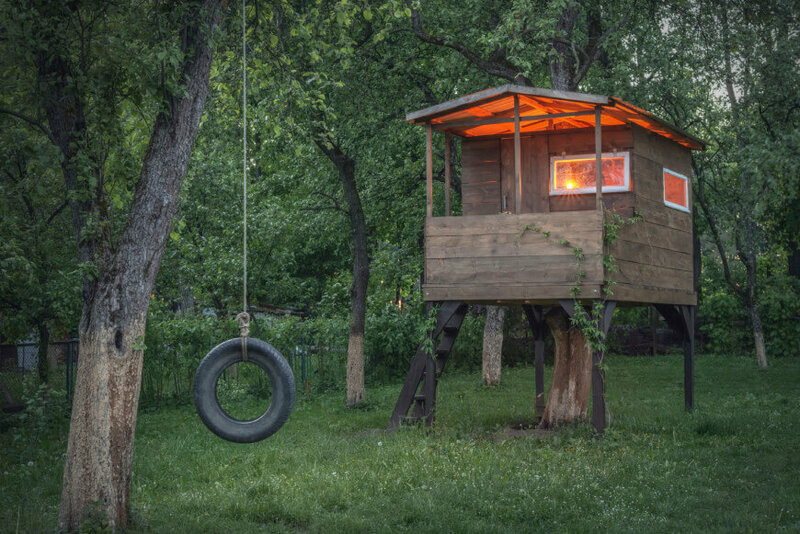 A tire swing is the perfect complement to this simple plank playhouse. Deceptively simple, this structure was actually built around a tree. 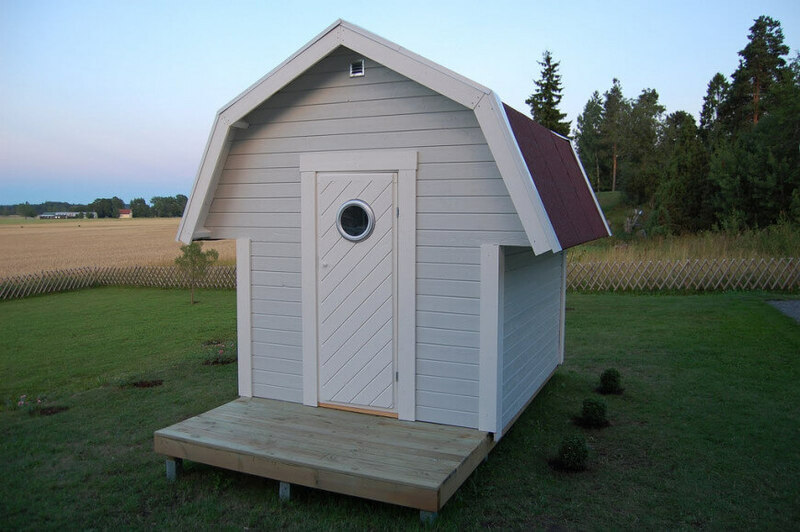 The modern style door, and front porch give an interesting contrast to this otherwise simple barn shaped playhouse. Source: Daniel Erckstam / Flickr. 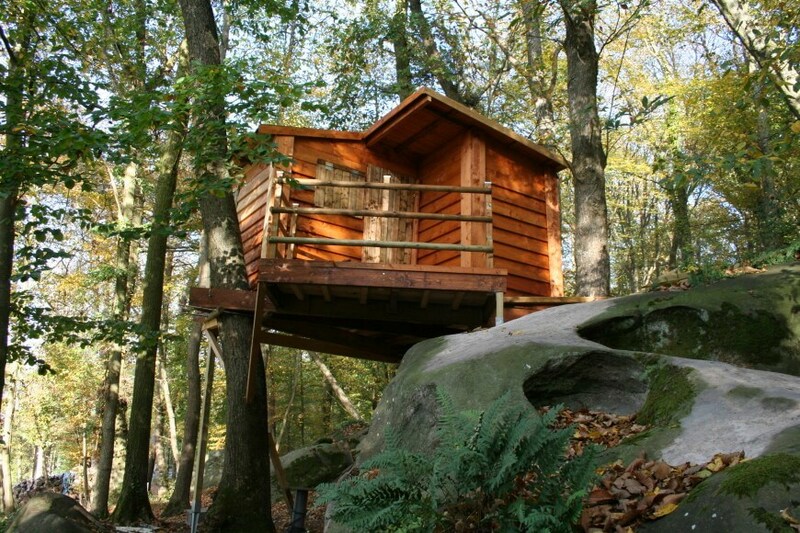 Perched between a rock and a tree, this playhouse looks out into a forest filled with mystery. We love the rich red stain of the siding. 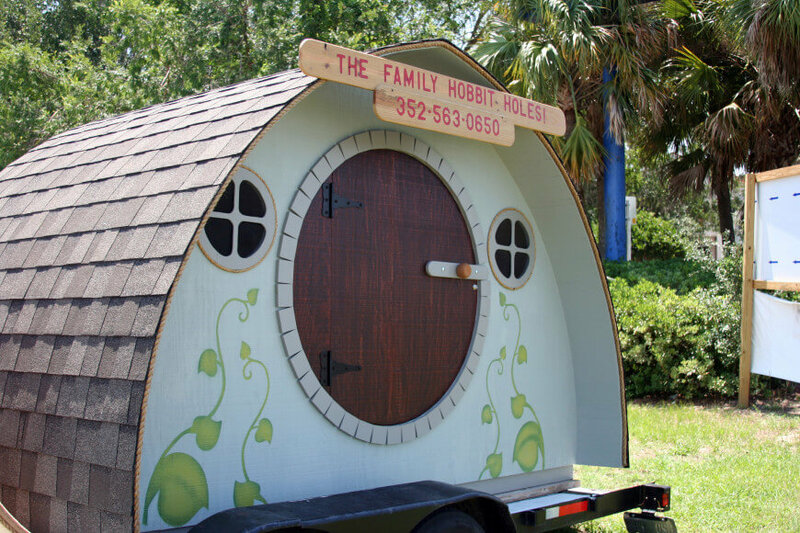 Take a trip to Hobbiton in your own backyard! 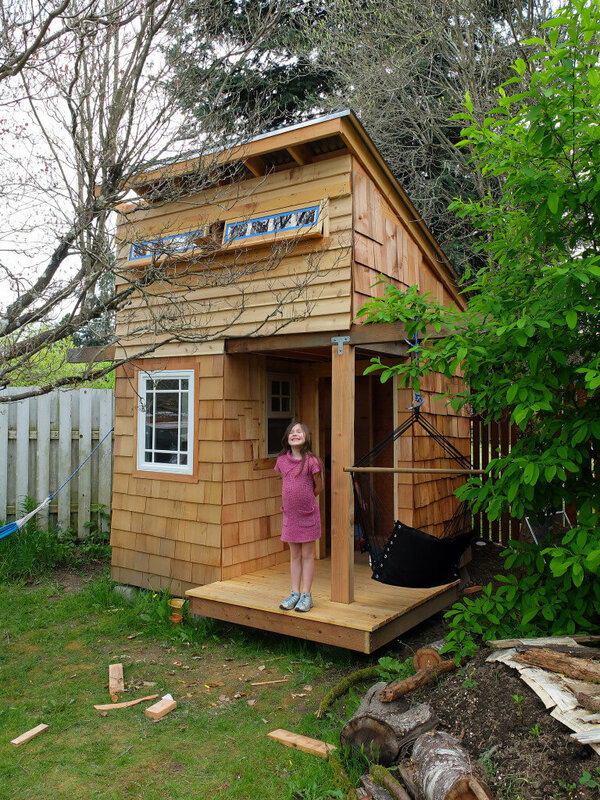 This dome-like literature inspired playhouse is great for conjuring all kinds of adventures! Source: Richard Elzey / Flickr. The hammock swing hanging from this playhouse is the perfect spot for your kids to relax outdoors and read. A lofted roof and window also provide ample light for reading inside too! Source: Jason Taellious / Flickr. 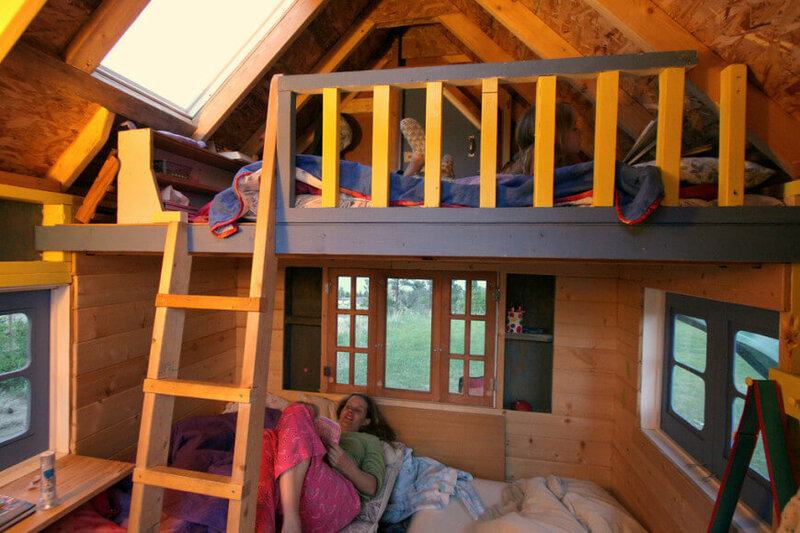 A view from inside this playhouse shows that adding a loft allows for plenty of space to play and sleep. What a great place it is to host a sleepover. We can almost hear the ghost stories! Source: Jeremy Heibert / Flickr. 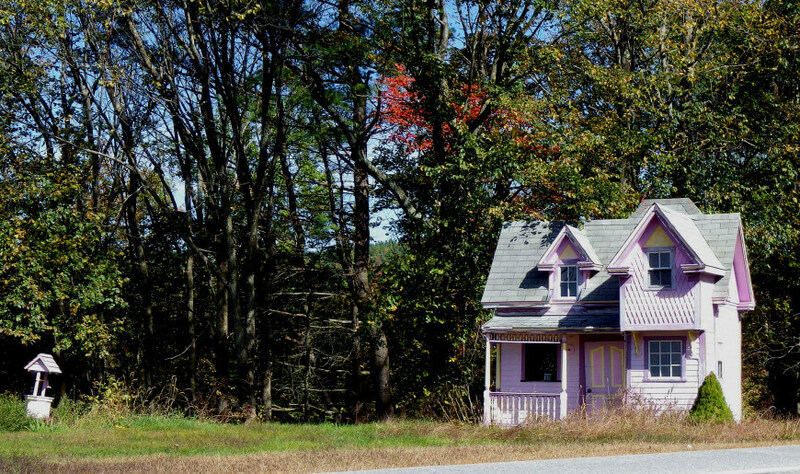 Wooden playhouse on stilts with pink gable roof. Incredible wooden playhouse on stilts with porch and deck and slide. 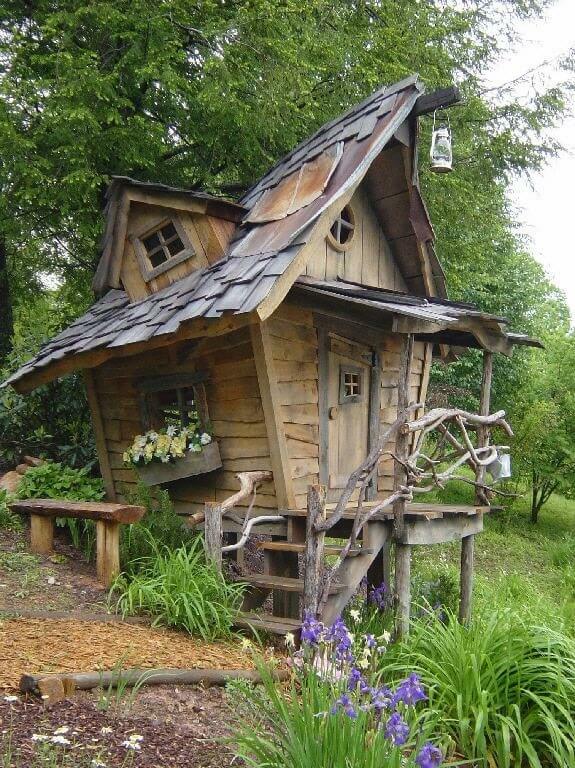 Crooked playhouse elevated on stilts with deck. Wow! Incredible white and pink playhouse with immaculate detail. Includes front porch. Close up of a crooked playhouse with windows and red shutters. 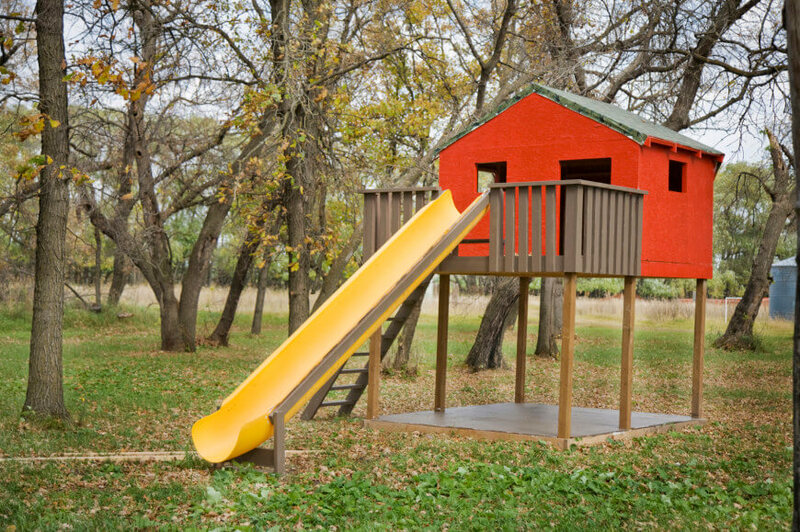 Red and yellow playhouse elevated on stilts with red slide and multi-colored staircase. Quaint light yellow playhouse with dormer window set in garden in the backyard. Large play house with long sloping roof, blue door and blue shutters. 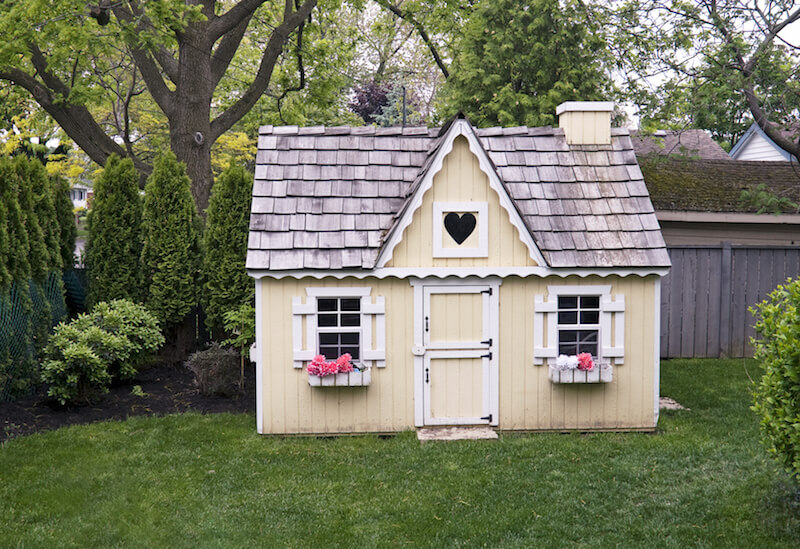 Small crooked playhouse with front porch in green and white. Elevated playhouse with firewood storage underneath. Beige playhouse with white door, small porch and slide. Cool playhouse with huge log beams and red roof. Very high up playhouse with ladder-like staircase. Nicely crafted natural wood playhouse with front porch. Gorgeous Victorian style yellow playhouse with white columns and red door. Bright multi-colored playhouse in the backyard.